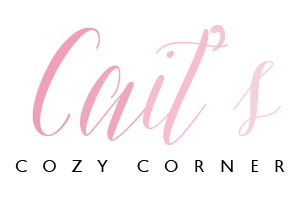 Cait's Cozy Corner : That Movie I Was In And Other Favorites! That Movie I Was In And Other Favorites! Thank goodness we made it to Friday! I don't know about you but I felt like this week dragged from Monday and Tuesday and then after Wednesday it flew. Granted, we had a lot going on this week after work so maybe that's the reason. This morning I'm actually at home for a little bit as we're waiting to get Lily evaluated for speech and possible physical therapy. Lily's been pretty pigeon toed since she began walking at 14 months and I just want to make sure we're doing everything we can to help her with her walking since she does tend to trip often. We're also getting her speech evaluated just to see if she needs an extra help during the week. 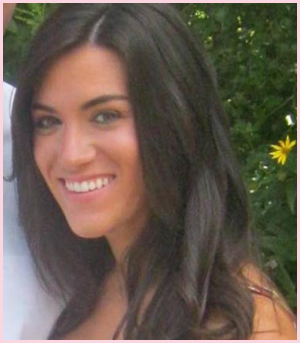 As many of you know who've been around my blog the last two year, Lily loves to talk! She could talk your ear off if you'd let her. The problem is putting sentences together or pronouncing certain words. I understand many kids aren't able to have that mastered right now at only 2 and half years old, but I still want to make sure, like her feet, that we're covering all the bases we need to set her up for success when she starts school in a few years. Tonight I'm super excited because Zach and I have a date night planned. This time, it's a pretty simple one of just dinner and a movie but to me, it's not just any movie. It's the Captain America Civil War movie that I was in last August when they filmed down here in Atlanta. That's right ya'll..I worked with Robert Downey Jr and it was ah-maz-ing. Now the worst part would be if both scenes I was in was cut. 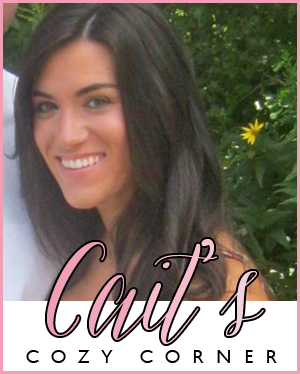 I'll keep you updated on my Snapchat ( @CaitW22 ) tonight so stay tuned! As tradition let's share some of my favorite things week! Please comment on what you're loving too so I can read them because your feedback always makes me smile friends! 1. Yoga Mats. 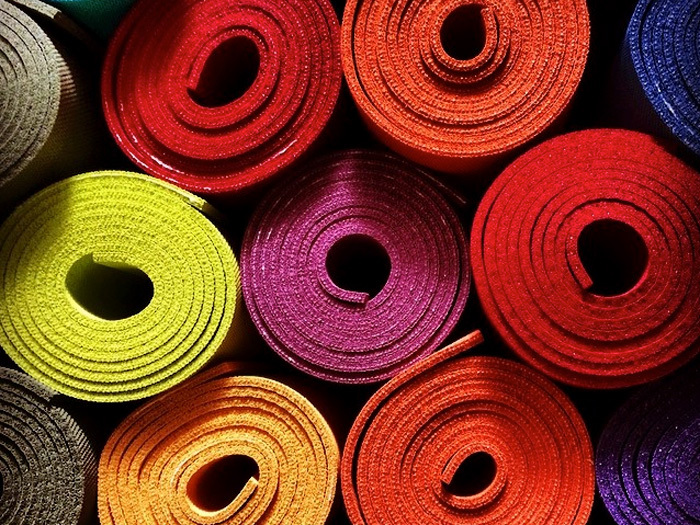 I've recently fallen in love with yoga mats. What?! They're just so colorful and vibrant for this time of year and I can't get enough of the fun patterns and textures. I'm really just excited about bringing one down with me tomorrow for the Yogathon ! Are you coming? 2. Movie Days. This week at work our social committee put together a fun movie spread for us. That's right, we actually got to watch a movie and take time out of our busy schedule to sit for a few hours. It was super fun even if the movie wasn't the best. 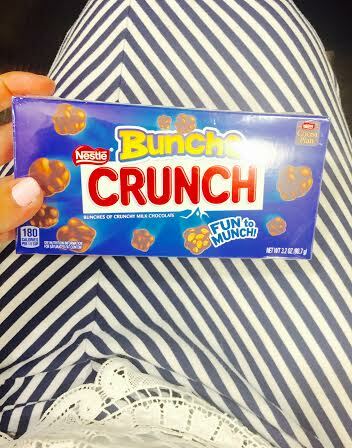 Oh yes, and snacks are always included so I snagged my other go to candy, Bunch a Crunch! 3. Blow Up Pools. With the weather slowly warming up down here in Atlanta, Zach and I wanted to make this summer a great one. 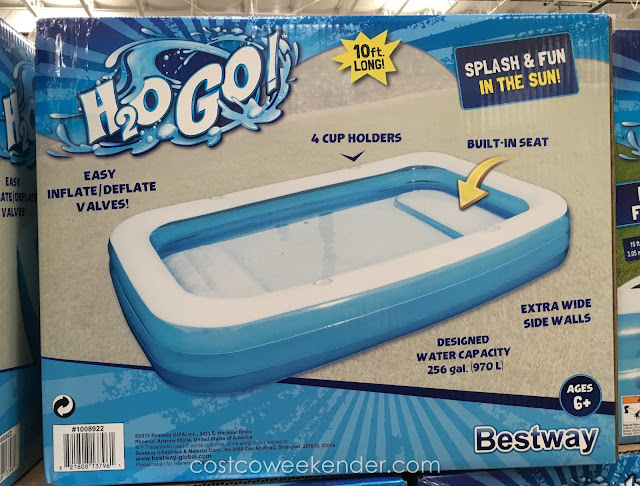 While visiting Costco last weekend we saw that they had a huge blow up pool for sale! This 10 foot pool also holds 256 gallons of water, has extra wide side walls plus seats and cup holders! You can bet we'll be having a blast in this thing for the next 3 months. Whose coming to join! 4. 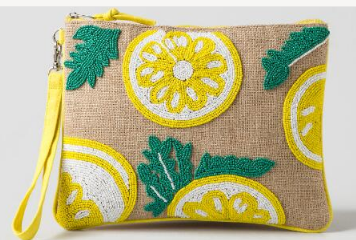 Lemon Clutch. I saw this clutch the other day and I'm so mad at myself for not getting it. It's the perfect little accessory for add to a beach bag with essentials, lip gloss or whatever your guilty pleasure. Plus I love the pop of color too! 5. Peep Espadrilles. You all know that I have the hardest time walking in heels so cute wedges like this are always a must in my closet. How adorable are these with this great black dress or cute jean shorts and a white tank. Don't you agree? 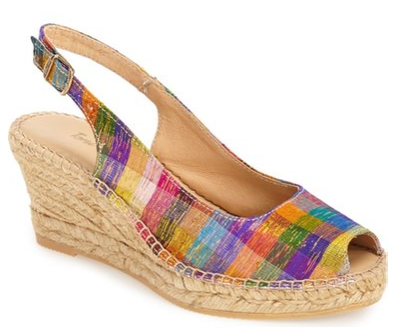 Do you love wedges, heels or flats? Tell me something you're doing this weekend! I love my yoga, and I loved that I finished my yoga challenge this week. If you have your daughter evaluated for walking, make sure they check her eyes as well. My sister used to be the same, always tripping, and it turned out the reason was that one of her eyes want working properly. Buncha Crunch are the WAY to go at movies! The best. 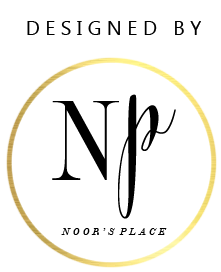 Is that the right snapchat handle? Trying to add you and you're not showing up. Hm. Love that clutch! It's such a sweet summer piece. I hope Lily's evaluation went well! I'm in grad school for Speech-Pathology, so my ears "perked" up when I read that part. :) Have a great date night! That is crazy awesome! I will keep my eye out for you next time we watch it (huge Marvel fan). Peep espadrilles are my home slice! Ooooh were you in the movie?!?! Did you have a speaking part or just an extra?!?!? Better add you to my snapchat! I hope you're featured in the movie. Good luck with Lily's appointment. My sister had to wear special shoes as a child to correct her pigeon toes.